Delicate broad whitefish, Baikal omul smoked on alder and aspen wood shavings, the exotic fish dish sugudai, and pastries with nelma (freshwater whitefish) – you can’t say you've been to Siberia if you haven't tried these tasty local fishes. Fish is a gastronomic symbol for many Siberian regions. Refined pike and sturgeon, fatty and lean kinds of whitefish – broad whitefish, muksun, cisco, Baikal and Arctic omul, as well as grayling, perch, and taimen – these fishes fill Siberian rivers such as the Yenisei, Ob, Lena and Angara. At one time fishing was one of the primary occupations of Siberia's indigenous peoples, especially those living in the North. The traditional calendar of the Nganasan people from the Taymyr Peninsula (more than 3,000 kilometers from Moscow), features months called “koly kiteda,” which means “the month when the fish comes.” These months were June and July, when fish used to be caught by nets and later eaten raw, wind-dried or frozen. The northern peoples have given us two exotic dishes that can be found in Siberia's big cities: Sugudai and stroganina. Today the “urban” version of sugudai consists of pieces of raw fish (often broad whitefish, cisco, muksun, or nelma), spiced with black pepper, spring onion, butter and lemon juice, while a plate of stroganina features thin slices of frozen fish. 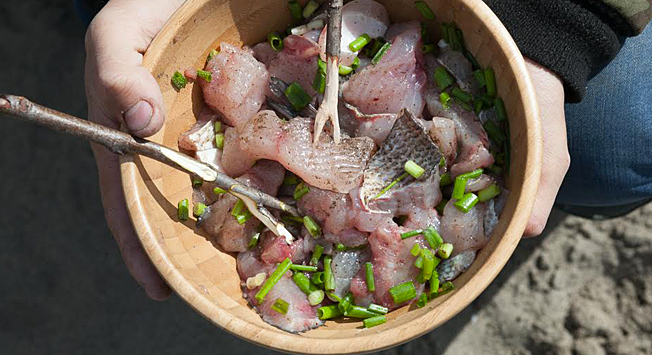 Siberia's indigenous peoples ate sugudai in a different way: Raw fish cut into pieces with hard wild onions. Salt was rare in the North in those days. It was brought there by traders and was expensive, so not every Nganasan, Evenk or Dolgan family could afford it. Paradoxically, one of the best places with Siberian cuisine, according to Siberian gourmands themselves, can be found at the restaurant Chemodan (suitcase) in Moscow. An average bill here starts at 3,000 rubles (about $47), but the fish dishes offered here are truly extraordinary: Telnoye (fish chop) of North Yenisei sturgeon in cheese sauce, or nelma slightly smoked with currant and cherry and served with mushrooms (1,350 rubles or about $21). Therefore, if you want to taste Siberia in Moscow and are ready to be as generous as a Siberian, Chemodan is the right choice for you. To get to know Siberian fish cuisine several regions are recommended. The first one is Krasnoyarsk Territory, which is rich in cisco and pike. In the region’s capital city, Krasnoyarsk (3,354 kilometers from Moscow), Bulgakov Bar has muksun in a spinach sauce with pureed carrots on the menu (460 rubles or about $7). The restaurant Gadalov offers pastries with nelma (180 rubles or about $3) and ukha (fish soup) with four kinds of fish (455 rubles or about $7), and Koroli i kapusta (Kings and Cabbage) invites their guests to dine on muksun sugudai (370 rubles or about $6). The “fishiest” cities of the region are Norilsk (2,878 kilometers from Moscow) and Dudinka (2,801 from Moscow). Here you will find numerous fish shops with smoked cisco, muksun, nelma, broad whitefish, yukola (dried and sun-cured fish) and caviar. In these stores the fish is fresh and cheap (200-400 rubles per kilogram or about $3-6), because it is caught in the nearby Yenisei River. The locals go to these stores with big bags and large bank notes, so that they can stock up for a big family dinner and get-togethers with friends. Many of these stores handle their own butchering, smoking and packaging. There are no special tours for tourists, but you can try asking owners to show you their production facilities. Experience shows that curious tourists with good intentions are often obliged. It is important to note that foreign guests need a special permit to travel to the cities of Norilsk and Dudinka. Another famous fish area in Siberia is Irkutsk Region, which is famous for its Baikal omul. To buy this fish it is best to go to Listvyanka (70 kilometers from Irkutsk and more than 5,000 from Moscow). In this small but lovely village there is a fish market where you can get cold omul (from 80 to 150 rubles for a “tail” or about $1.50-2.50) and smoked omul. The latter is smoked by local people on wood shavings of alder and aspen, which gives the fish its unusual, delightful aroma (250 rubles for a “tail” or about $4). The small transparent Baikal oilfish (golomyanka), that lives in Lake Baikal at great depths, is sold here as a beer snack (from 100 to 300 rubles for a bunch or about $1.50-4.50). If you travel along the Trans-Siberian railroad, keep in mind that you will have a chance to buy smoked omul at a cheaper price at stations close to Lake Baikal, Slyudanka and Severobaikalsk. It is worth bargaining with the sellers: Sometimes right before the train leaves you can get “a tail” that just a minute ago cost 50 rubles, for only 20. Which kind of delicious Siberian fish dishes would you eat?